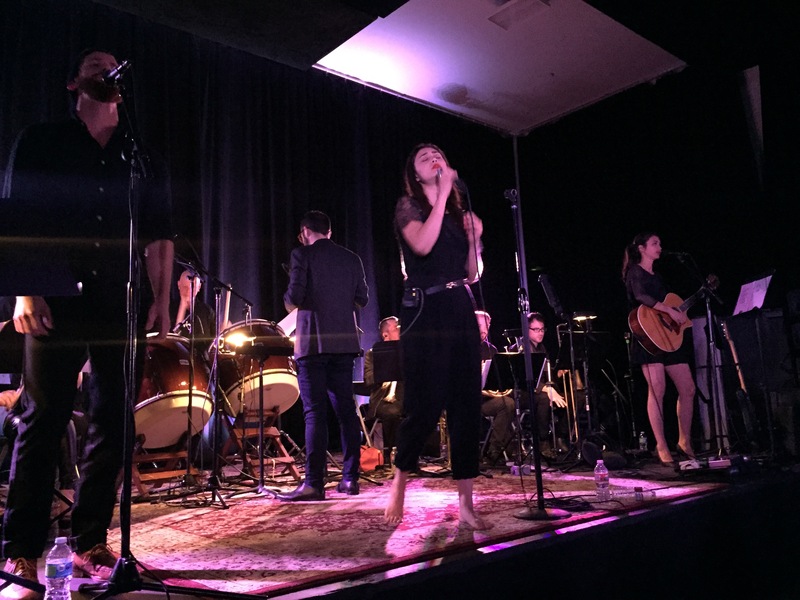 Singer-songwriter Dia Frampton and film composer Joseph Trapanese perform their newest project, ARCHIS, front-to-back at their EP release show this past Monday, 2/23/2015. Los Angeles. Photo by Rachel Ann Cauilan. If there could be a soundtrack to singer-songwriter Dia Frampton‘s life in the past ten years of her career in the music industry, that soundtrack would culminate into the project of what is now known as Archis. Archis, a collaboration between Frampton and accomplished film composer Joseph Trapanese (Tron, Oblivion), merges the symphonic instrumentation of the orchestra with pop vocals. For anyone who has followed Korean-American singer Frampton’s career, you would know that she has co-fronted the popular alt-rock band with her older sister Meg in Meg & Dia from 2004-2012. She has been signed to the independent label Doghouse Records, major label Warner Bros., only then to get dropped and her band forced to go independent. In an act of hesitation, Frampton reluctantly decided to audition for the inaugural season of The Voice in 2011, unexpectedly winning on Team Blake Shelton and becoming the runner-up. Since then, Frampton has struggled to find her next move. Two years since marks the birth of this project and, last Monday night, the Archis team was more than ready to release their debut six-song EP. Joseph Trapanese of ARCHIS performing live at Swing House Studios, Los Angeles for EP release show. 2/23/2015. Courtesy of Amanda J. Cain. 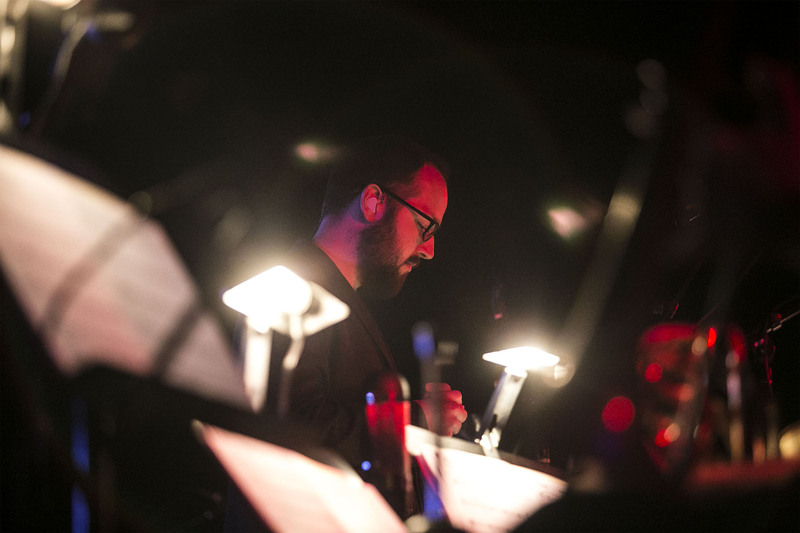 With a live orchestra full of crooning strings, loud brass instruments, light woodwinds and thundering percussions, Trapanese led his nine-piece orchestra from behind Frampton, who wielded the mic with back-up vocalists David and sister Meg beside her. Playing two sets that night, one at 6:30pm and the latter at 9:30pm, industry friends, label mates and long-time fans and supporters came to show their love and support for Frampton. Donned in all-black attire played to slow, richly textured instruments, Archis let the music play out naturally, giving enough time and space to create a particularly moving soundscape. The contrast of the horn-section paired with Frampton’s warm and angelic voice is unusual, but works. Frampton opened with “Blood,” which she notes was written at one of her lowest points. “Blood” is an emotional song tinged with elements of hope, marching drumbeats, an increasingly crooning horn-section and Frampton’s piercing vocals. Following with “Black Eye,” a rather uplifting song with strong brass sounds and pop appeal, Frampton speaks with a bitter tongue of protecting a younger sister. “Bittersweet” (the one that never ceases to make me cry) is a beautifully haunting tune with lingering piano keys that remain with the listener as she reflects, ‘Take these tired wings. Home is calling you to sleep.’ Deeply internal and nostalgic, the song carries the message of moving onward, keeping memories of happy tears close and forgiving past memories. The second-half of the EP continues with the pop-friendly “I Need You,” which Frampton marches through with steady drumbeats and powerful notes of coming from a small-town, battling nights alone and facing the rocky road. “Good Love Lingers On” comes next, with Frampton’s heart-piercing vocals soaring over the richly symphonic strings and light keys telling a tale of good love. Closing with horn-filled, march-inducing drumbeats, “Let Me Love” is an anthemic song that hits listeners hard. Singing, ‘Love is all that I have so, let me love who I want. All the dreams that I’m chasing break my heart then replace it,’ Frampton powers through Trapanese’s thundering instrumentation, proving their collaboration sweet, dramatic and entirely epic. Frampton, a veteran of the music industry known for her uniquely angelic, soulful and at times heart-shattering voice, has long anticipated the release of Archis. With the full-length album set to release over the summer, they can only hope that people will continue to talk about it so they can do it all over again. A richly powerful, heart-rending, and uniquely filmic collaboration, Archis deserves both your ears and hand. The EP is available to listen on iTunes, Spotify and Google Play, now. Also, feel free to watch the two music videos for “Blood” and “Bittersweet”, and keep up with all things Archis at archismusic.com, Facebook, Twitter and Instagram.